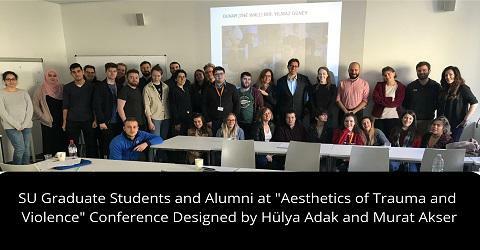 As part of the British Academy Newton Project "Literary and Filmic Representations of Trauma, Justice and Reconciliation in Northern Ireland and Turkey," led by Hülya Adak and Murat Akser (University of Ulster), a workshop on "Aesthetics of Trauma and Violence" was held at the Freie Universitaet Berlin on 15 February 2019. Graduate students from the Cultural Studies Program at Sabancı University, including Katie Bradshaw, Pınar Umman, Rudi Pulatyan, and Alper Turan presented fascinating papers with topics ranging from Afro-German and Afro-Turkish autobiographies to Prison Films of the 1980s and 1990s and HIV/AIDS in Turkey. Two Sabancı alumni, İpek Şahinler and Dr. Egemen Özbek, were also among the participants.